Here is a listing of most of the custom transformers that Peter has designed to date. This is not EVERYTHING that we can do, it’s just what customers have requested over the years. If you don’t see what you need here, please call or send an e-mail and Peter will work up a design for you. Prices are not shown, as some of these units were built as much as 4 years ago. Copper prices change daily and steel prices change monthly. 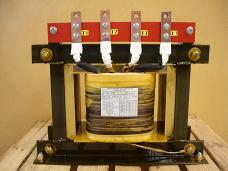 While we do our best to keep our transformer prices as stable as possible, we can’t hold pricing in place for years.